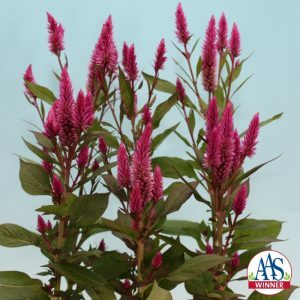 All-America Selections, the only trialing organization for plants that demonstrate great garden performance throughout North America, presents the first five AAS Winners for the 2017 garden season. Each of the following award-winning varieties was trialed in North America by professional, independent judges during one growing season. Each AAS entry is trialed next to one or two comparison varieties that are considered best-in-class among those currently on the market. With a July announcement, these AAS Winners are available for immediate purchase. With this announcement, these varieties become available for immediate sale to the commercial and home garden markets. Links on each company name below the descriptions lead to the appropriate email address from which to order that variety. Brokers, growers, mail order and seed packet companies can purchase these varieties immediately. Retailers and consumers will find these AAS Winners for sale for the 2017 gardening season as supply becomes available throughout the chain of distribution. Garden communicators are free to begin writing about these varieties now to build anticipation for 2017 gardens. Each AAS Winner will be marketed through an extensive Social Media and public relations campaign. Display Gardens grow, label and display AAS Winners from the past five years. This spiked beauty claimed victory in North America’s trial sites to become the first ever AAS Winner from Japanese breeding company Murakami Seed. The judges gave this entry high marks in the greenhouse for the good branching, almost bushy growth habit and early-to-bloom flower spikes. Bred by Murakami Seed Co., Ltd.
A unique red okra with pods that are round, not ribbed, and a brighter red color than the reddish burgundy okras currently available. This high-performing AAS Winner received high marks for productivity, taste, texture and tenderness as well as the ornamental value of red pods on red stems. One judge noted that Candle Fire okra was quite maintenance free to grow, except for the frequent harvesting, which is a great thing! Candle Fire thrives in the heat and is disease resistant even in hot humid climates like the south where it’s perfect for traditional fried okra. This compact beauty produces sweet, uniform pods that are very tender when harvested early. With only 40 days needed to maturity, Patio Pride can be one of your first spring harvests, or one of the last fall harvests from your Southeastern garden! This pea is wonderful when planted in containers and is ideal for succession planting yielding a consistent harvest over many weeks. Plant in patio containers with cool season flowers for a beautiful combination ornamental and edible display. Direct seeding is recommended; seed 3-4 seeds every 6 inches then thin to one seedling every 6-8 inches. Honeybaby is a very productive variety of winter squash producing numerous fruits on a compact plant. These shorter vines grow 2-3 feet in a semi-bush habit showing great garden vigor which results in healthier plants that resisted powdery mildew later into the season, especially in the Southeast. Short, wide fruits are slightly larger, sweet and nutty and more meaty than similar comparison varieties. Honeybaby is delicious steamed, baked or made into soups and stews. Plant as soon as soil temperatures reach 65 degrees to ensure maturity in 90-100 days. This personal-sized Asian watermelon is perfect for smaller families and smaller gardens. Shorter vines (3-4’) still produce up to six fruits per plant and can be grown in smaller spaces. Several judges commented on the crack and split resistant rinds, important for reducing crop loss. For culinary purposes this deep red fleshed watermelon has a thin but strong rind that can be carved into attractive shapes for fruit salad presentations. Mini Love has a high sugar content resulting in sweet and crisp, juicy flesh that will be a true summer delight for watermelon lovers.